Clearly of volcanic origin, the Azores Islands formation is still the subject of hot debate among geologists. Were the islands once part of the African continent, or did they arise from submarine fissures through which the earth’s molten core spewed out boiling magma? The latter theory is dominant, though some botanists and others dispute it, as we shall see below. Anyway, it all happened some 30-40 million years ago. The islands’ volcanic nature is still very evident today. Periodic eruptions occur from the remaining active volcanoes, most recently in Angra, but usually with advance warning and few casualties. The cones and craters of volcanoes provide a characteristic feature of Azores landscape, with lava rivers spilling their petrified streams down to the sea, and subterranean heat most dramatically felt in the Fire Mountains of Pico and now being utilized as geothermal power. But if this conjures up a picture of aridity and bleakness, nothing could be further from the truth. 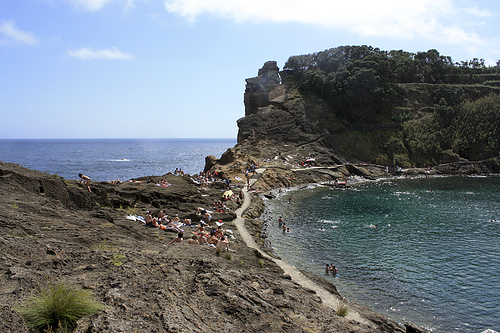 The total area of the archipelago is 2,923 square miles, the largest island being Sao Miguel and the smallest Corvo. Generally speaking, which is tricky when you’re dealing with nine such different islands, the five westernmost islands are mountainous and green, while Flores and Corvo in the east have lesser peaks and share more in common with North Africa. The highest mountain in the Azores, indeed in all of Portugal, is Mount Pico in Pico Island, the summit often snow-covered in winter. The islands all tend to have steep coastal cliffs in the north, the south coast’s generally being more level, most of the best beaches are in the southern parts. The volcanic origins are everywhere to be seen. In the profusion of cones, in the calderas or craters, great saucers with mountainous walls, such as Terceira’s Las Caliadas and Santa Maria’s Caldera de Bandama, in the malpaises, literally ‘badlands’, where grey or reddish lava streams have solidified such as the 125 sq metre volcanic desert around Flore’s Montanas del Fuego.